When dental restoration is necessary following decay or damage, the La Plata Dental team offers quality, long lasting smile repair services. 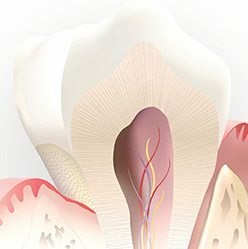 Using the latest dental techniques and technologies and durable materials, we provide restoration that looks and feels just like your natural smile. If you’re in need of smile repair from a simple filling to complete tooth replacement, don’t hesitate to contact La Plata Dental to find out more or schedule an urgent care appointment. Dental crowns and fixed bridges have offered reliable, effective dental restoration for decades, and they remain two of the most often used treatments in the field. The La Plata Dental team still uses these restorations regularly to recreate damaged smiles. We offer crowns and bridges in a variety of materials to ensure patients are completely confident in the long lasting results. 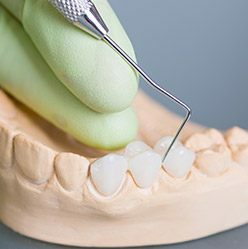 For decayed or damaged teeth, to protect a root canal treated tooth, and to replace missing teeth, crowns and bridges are versatile and functional solutions. Unlike traditional amalgam fillings that impacted the cosmetic appearance of patients’ smiles and required the loss of healthy tooth enamel to remain in position, tooth-colored fillings create flawless restorations without negatively impacting healthy teeth. Using a composite-resin material that can be shaded to blend into the natural smile line, tooth-colored fillings offer complete smile restoration. We can also use this tooth-colored filling material to correct and conceal cosmetic flaws during direct bonding procedures. Partial and full dentures are used to restore smiles following extensive tooth loss. 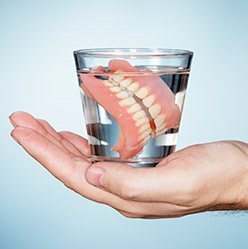 Both forms of dentures use a gum-colored material to create a supportive base for a number of replacement teeth or a full row of prosthetic teeth. Partials are crafted to fit between teeth. Then, the base is held in position with metal clasps connected to the remaining tooth structure. Dentures are molded to fit against the gum line creating suction that holds the prosthetic in place. 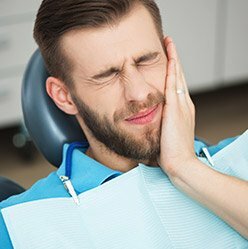 Root canals are necessary when damage or decay accesses the innermost layer of the tooth where the nerve system is housed. This direct interaction with the nerve creates a painful toothache and sensitivity to changes in temperature. 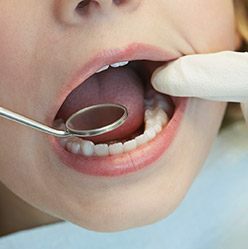 We can save the tooth from extraction by removing the damaged pulp and nerve tissue, refilling the root canals, and placing a dental crown to protect the treated tooth. The safe, comfortable process is typically completed in two to three visits.